A law barring New York City food-service businesses and stores from using most Styrofoam products has gone into effect. The Styrofoam ban is among more than a dozen new laws that went into effect on New Year’s Day. 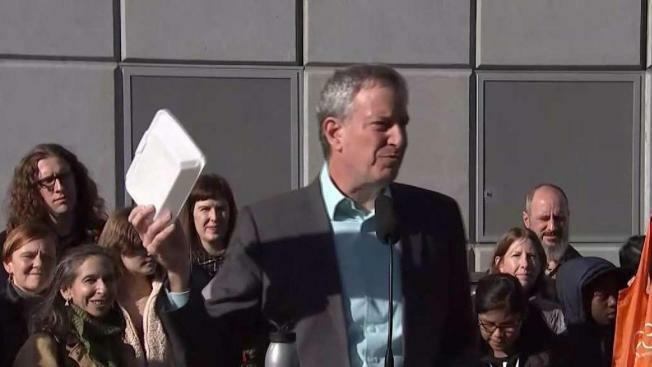 “The 60 million pounds of styrofoam New Yorkers throw away each year clog our landfills and fuel the petroleum economy destroying our planet,” de Blasio said in a statement. “We’re ending this dirty practice so we can ensure a cleaner, fairer future for our children,” he added. The city is giving businesses a six-month grace period to adjust to the ban before it starts imposing fines for violations. Small businesses that may be adversely affected by the ban can apply for "hardship exemptions" from the Department of Small Business Services, the mayor's office noted.